How Do I Prevent My Garage Door From Getting Hacked? Garage door hacking is just like any other type of hacking. Someone gets access by virtually breaking into your home, and by passing security features. So, you may be wondering if your garage door security is really worth the price tag after hearing about hacking. The truth is that majority of security systems are good for making you feel safe, and may not actually do the job of keeping you safe. The technology age that we are in, it has made things a little scarier, as unlike a regular lock, you may not see signs of a virtual lock being broken. As you are certainly aware, your garage door is a vital entry point to your home. Often times homeowners keep their valuables inside these doors, as well as leaving the entry to the home through a garage unlocked due to their garage door being locked. This is a bad idea as it is asking someone to break in and take your things by not being cautious. Not to mention, garage doors have been becoming more and more high-tech, even offering internet access for some features, which are great, but it opens up more possibilities to hack your garage door. We first started making garage doors in the mid-1920s in the U.S. It all started with a wired keypad that could be used with your car. At this point you needed direct access to the keypad to open the garage, there was no other way to get in. As technology grew, so did the offerings for garage doors. Wireless garage door openers came into play that were activated by a radio signal. These became vastly popular, but, as with most new items, there was a flaw. Garage door openers from one manufacturer all opened using the same code, this meant that hacking garage door was as simple as buying several replacement remotes from different brands and trying each one until the garage door opened. So the manufacturers got to work on ways to get around this flaw, and eventually came up with a new and improved dip-switch system. There were about 8-12 small switches that were required to be placed in either an down or up position. The switches that were on the opener, were now required to match the remote. That changed the number of unique garage door codes from a low 256 to a much higher 4,096, depending on the amount of switches that were on the garage door. This made the task harder, and required a criminal to get a little smarter on how they would get access. Now a computer would come into play as a way to run the possible codes to hack your garage door. With this technique criminals once again had access in mere seconds. What Can I Do If My Garage Door Has Been Hacked? 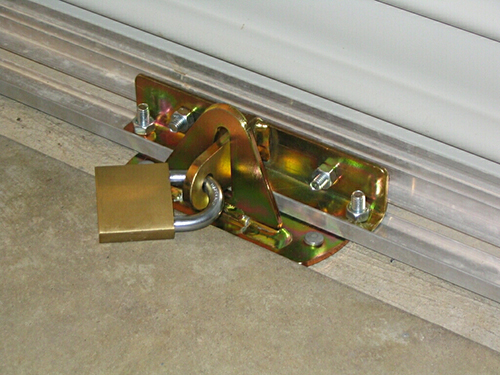 What should you do in order to protect yourself and your garage door? This may fell a little scary or even overwhelming for some to discover that garage doors can be hacked with such simple methods. So, what should you do about it? If you are worried about your garage door safety call us at Clarks Garage Door & Gate Repair for a check up. We will examine your garage door and help you determine if you need to upgrade your security features, and go over some tips to keep your family safe in your home. Call (877) 622-8183 now for a free quote on your garage door service today!